I love how dainty Fuku-chan is! There's about 7 comments on this blog post on how her genteel, soothing aura as well as her side profile remind people of Konkon. I wonder if that's part of why I like this girl so much! Many of Japanese wotas regard her appearance as classical, at times saying that she looks like beauty of the early 20th century Japan. A few of them presume that she might be nobly born not only because she behaves in sophisticated manner and comes from a wealthy family but because her family name is identifiable﻿ with a name of aristocrat of the Ryukyu Kingdom that ruled Okinawa. No love for princess Mizuki? Looks like she's gonna have to cut someone! Nocchi's glad to see Fuku-chan is doing well. 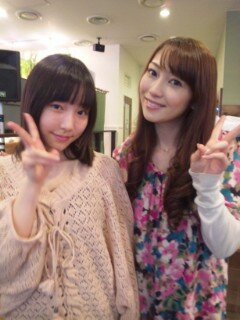 There's a lot more recent Fuku-chan tidbits in the 9th Gen Updates Thread. I don't want to clog it up here with other peoples' cross-posts. My first post in the Fuku thread! I like this girl a lot, but can't say the specifics. :-/ I just needed to post in her thread cuz she's the only one out of 9th gen that I haven't commented on. I'm glad she made it in, even though I preferred Saho Akari, but Fuku makes an awesome fit. I've been listening to Shouganai Yume Oibito, and I have this strong urge to see her perform it, as well at the rest of 9th gen.
"FUKU FUKU FUKU FUKU FUKU FUKU FUKU FUKU FUKU FUKU FUKU FUKU FUKU FUKU FUKU FUKU FUKU FUKU FUKU FUKU FUKU FUKU FUKU FUKU FUKU FUKU FUKU FUKU FUKU FUKU FUKU FUKU FUKU FUKU FUKU FUKU FUKU FUKU FUKU FUKU FUKU FUKU FUKU FUKU FUKU FUKU FUKU FUKU FUKU FUKU FUKU FUKU FUKU FUKU FUKU FUKU FUKU FUKU FUKU FUKU FUKU FUKU FUKU FUKU FUKU FUKU FUKU FUKU FUKU FUKU FUKU FUKU FUKU FUKU FUKU FUKU FUKU FUKU FUKU FUKU FUKU FUKU FUKU FUKU FUKU FUKU FUKU FUKU FUKU FUKU FUKU FUKU FUKU FUKU FUKU FUKU FUKU FUKU FUKU FUKU"
This girl's got into my head like Konkon and Mano-chan. Anyway, I'm just wondering how often she's going to be doing cartwheels in PVs and concerts from now on. It seems like this talent could very easily be overused and become cliché. I heard Eripon also does some basic gymnastics, which she demonstrated at a fan event. It's official. I support Fukuchan. BOOYEAH, FIRST 9TH GEN TO GET A DVD! 1. Morning Musume: Maji desuka SKA! - Sayu and Mizuki saying "kawaii!" Literally taken, neko wo kabutteimasu, can mean to wear a cat on your head. The verb kaburu (here in the continuous kabutteimasu), means to wear on the head. But it can also mean to wear on the face in the manner of a mask, which is where the idiom comes in. ...something akin to the english phrase "a wolf in sheeps clothing". It means to wear a cat in the manner of a mask on ones face, to look like docile and sweet-natured, obscuring one's true nature. I've also seen it explained as "pretending to be higher class" or something similar. As a result, Sayu was wondering if it's because Fuku-chan's a kid or because she's a baka. On the radio show Fuku-chan says it's the latter. At the beginning when Sayu asked about whether Fuku-chan is smart, Fuku-chan replied she's dumb. Only Irorin has more trouble answering these questions, and Fuku-chan has to ask what one of the words is. 1. Fuku-ninja is a mammal. 2. Fuku-ninja fights ALL the time. 3. 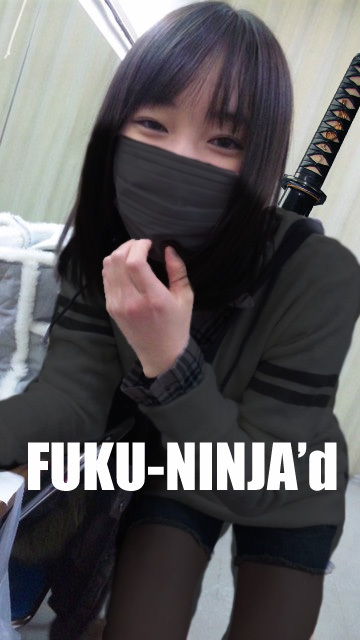 The purpose of the Fuku-ninja is to flip out and kill people. I'm amused that only Ai-chan is shown clapping, since she's known for being quite easily amused. Poor Mizuki fell toward the end of Maji Desu ka Ska! One of her belts fell down and made her fell down to the floor. Sticky situation, but she recovered quickly by removing the belt asap and tossed it to the side of the stage. Other than Gaki, I don't think the other members notice. - Mirai wa kimatura-san(?) asking something about shopping.. which they'd get(? ), part of a test- 1. Tissue, 2. Candy, 3. Waribikikan(reduced price? ); Mizuki says Candy, Riho says Tissue; Mizuki says candy is delicious and Riho says tissue because of her nose running(? ); Sayu reveals the meanings..
Tissue 50%..Something about friends(? ); 0%..Mizuki says she's happy, says something about her mother; Sayu says she's "tennen"; Mizuki talks about being "tennen"
Replying to a quote, with a quote. Thanks to twissie and Slack. Has to be said again. Page created in 0.594 seconds with 19 queries.